The Distinguished Service Award is the highest award bestowed on UC Cooperative Extension academics, and recognizes outstanding accomplishments by UCCE academics for academic excellence; the impact ofthe activities on target audiences and clientele; evidence that the combined effort resulted in contributions greater than an individual member's contribution; and cross-disciplinary integration among UCCE and appropriate faculty and workgroup members. 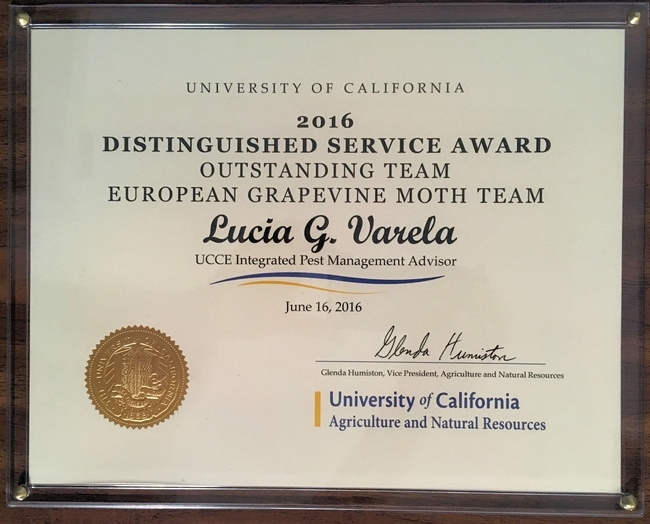 Lucia Varela, IPM Advisor and Rhonda Smith, Viticulture Farm Advisor of UCCE Sonoma County along with seven other team members were recognized for their work to eradicate EGVM with an environmentally sound pest management approach that relied on the use of mating disruption and reduced risk insecticides. 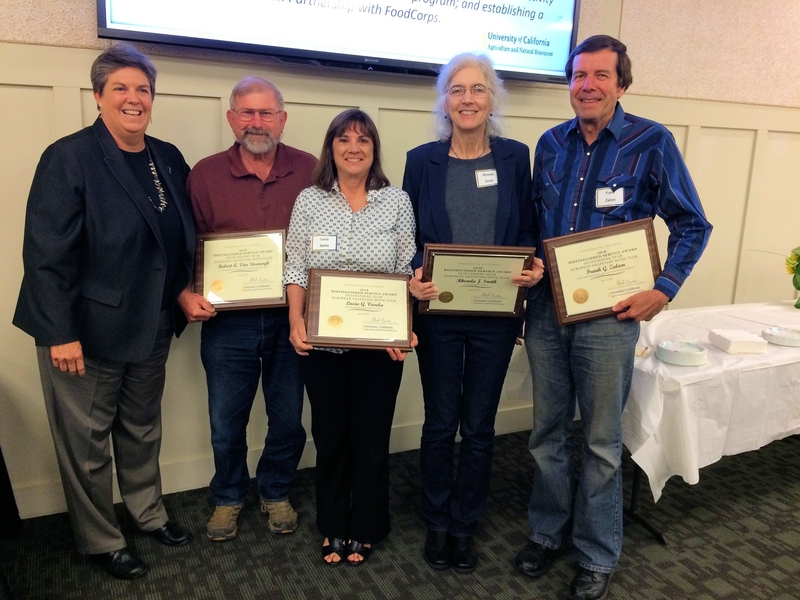 Pictured: Glenda Humiston, VP UC Division of Agriculture and Natural Resources; Robert Van Steenwyk, UC Berkeley Specialist Emeritus; Lucia Varela; Rhonda Smith; Frank Zalom, UC Davis Specialist. Not pictured: Walt Bentley, UC IPM Entomologist Emeritus; Larry Bettiga and Monica Cooper, Viticulture Farm Advisors in Monterey and Napa Counties respectively; Kent Daane, UC Berkeley Specialist; and Joyce Strand, UC Davis IPM Academic Coordinator Emeritus. Glenda Humiston, VP UC Division of Agriculture and Natural Resources; Robert Van Steenwyk, UC Berkeley Specialist Emeritus; Lucia Varela; Rhonda Smith; Frank Zalom, UC Davis Specialist. Not pictured: Walt Bentley, UC IPM Entomologist Emeritus; Larry Bettiga and Monica Cooper, Viticulture Farm Advisors in Monterey and Napa Counties respectively; Kent Daane, UC Berkeley Specialist; and Joyce Strand, UC Davis IPM Academic Coordinator Emeritus.